raylib is highly inspired by Borland BGI graphics lib and by XNA framework. NOTE for ADVENTURERS: raylib is a programming library to enjoy videogames programming; no fancy interface, no visual helpers, no auto-debugging... just coding in the most pure spartan-programmers way. Are you ready to learn? Jump to code examples! 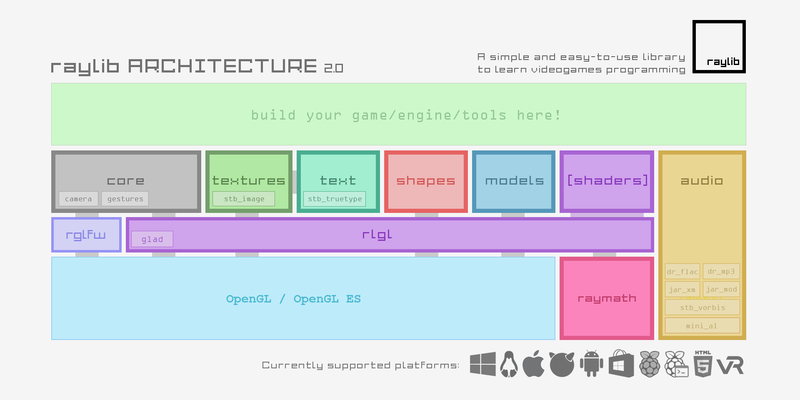 raylib supports multiple target platforms, it has been tested in the following platforms but, technically, any platform that supports C language and OpenGL graphics is valid for raylib or can be very easily ported to. Do you need help with raylib? Do you want to keep updated with latest news? Do you want to show your raylib creations? Join our amazing community of raylib developers! Choose the network you prefer! You are welcome! I'm working hard on raylib but my resources are limited. If you enjoy raylib and want to help, consider a small donation or contributing to the project on GitHub. Thanks! - Multiplatform: Windows, Linux, MacOS, Android, HTML5... and more! - Full 3d support for 3d Shapes, Models, Billboards, Heightmaps and more!